Using the Event Horizon Telescope, astronomers have measured the magnetic fields just outside the event horizon of Sagittarius A* for the first time. “Understanding these magnetic fields is critical. 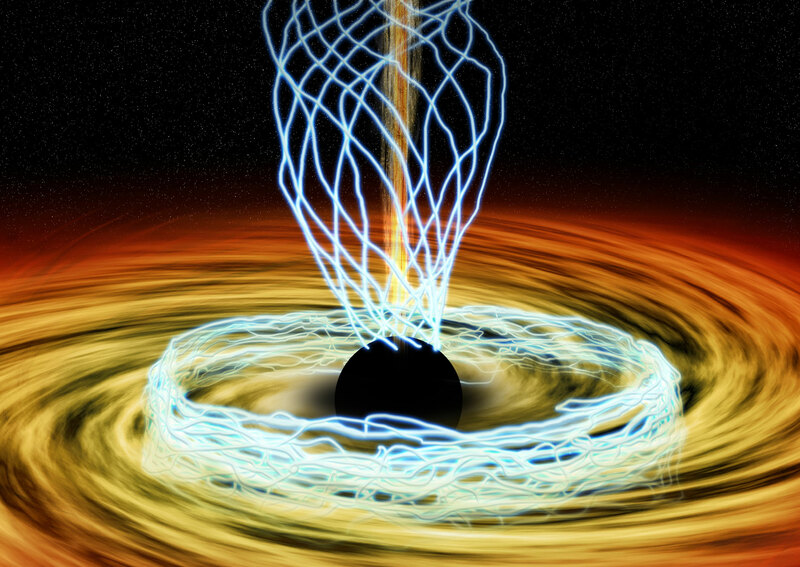 Nobody has been able to resolve magnetic fields near the event horizon until now,” says lead author Michael Johnson of the Harvard-Smithsonian Center for Astrophysics (CfA). The results appear in the December 4th issue of the journal Science. “These magnetic fields have been predicted to exist, but no one has seen them before. Our data puts decades of theoretical work on solid observational ground,” adds principal investigator Shep Doeleman (CfA/MIT), who is assistant director of MIT’s Haystack Observatory. Such resolution is needed because a black hole is the most compact object in the universe. The Milky Way’s central black hole, Sgr A* (Sagittarius A-star), weighs about 4 million times as much as our Sun, yet its event horizon spans only 8 million miles – smaller than the orbit of Mercury. And since it’s located 25,000 light-years away, this size corresponds to an incredibly small 10 micro-arcseconds across. Fortunately, the intense gravity of the black hole warps light and magnifies the event horizon so that it appears larger on the sky – about 50 micro-arcseconds, a region that the EHT can easily resolve. These observations used astronomical facilities in three geographic locations: the Submillimeter Array and the James Clerk Maxwell Telescope (both on Mauna Kea in Hawaii), the Submillimeter Telescope on Mt. Graham in Arizona, and the Combined Array for Research in Millimeter-wave Astronomy (CARMA) near Bishop, California. 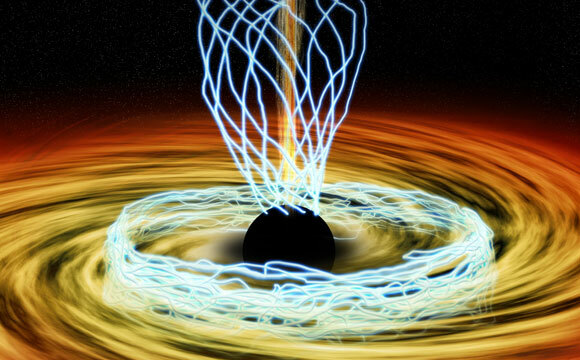 As the EHT adds more radio dishes around the world and gathers more data, it will achieve greater resolution with the goal of directly imaging a black hole’s event horizon for the first time. “The only way to build a telescope that spans the Earth is to assemble a global team of scientists working together. With this result, the EHT team is one step closer to solving a central paradox in astronomy: why are black holes so bright?” states Doeleman. EHT research at CfA and MIT is supported by supported by grants from the National Science Foundation and from the Gordon and Betty Moore Foundation. The Submillimeter Array (SMA) is a joint project between the Smithsonian Astrophysical Observatory and the Academia Sinica Institute of Astronomy and Astrophysics. The Submillimeter Telescope is part of the Arizona Radio Observatory, which is partially supported through the NSF University Radio Observatories program. The James Clerk Maxwell Telescope was operated by the Joint Astronomy Centre on behalf of the Science and Technology Facilities Council of the UK, the Netherlands Organization for Scientific Research, and the National Research Council of Canada. Funding for CARMA development and operations was supported by NSF and the CARMA partner universities. 1 Comment on "Astronomers Measure Magnetic Fields at Sagittarius A*"
Sagittarius constellation curves to the center of the Milky Way Galaxy, where the concentration of Dark Matter should be more. Gravitation between two light matter will always be attractive whereas the the gravitational force between Light Matter and Dark Matter is bound to be repulsive. This is the reason for the Dark Matter in the center of the galaxy preventing all stars to clump together at the center and they are thrown out in spiral wings around the center. By the same argument, it should be possible to throw out the light (Electromagnetic wave) from the galaxies in gravitational lensing effect by the intervening Dark Matter. In the Black Hole the neutron stars are crumbling and their high energy emitted including light, X-rays and Gamma rays towards its Dark Matter center should be thrown out when the high density neutrons attract and absorb the electromagnetic rays. This phenomena results in these spectacular view of Magnetic fields forming a lotus array at the center. Thank You.